Mexican gray wolf M877 was born at the Endangered Wolf Center in Eureka, Missouri, in 2004. He was one of a litter of 10 puppies, including 6 brothers and 4 sisters. He and his brothers all moved to Living Desert State Park in Carlsbad, New Mexico, before their 2nd birthday. Over the years, some of the brothers were transferred to other facilities until only M877 and one brother were left. When that brother passed away in 2015, M877 retired to Southwest Wildlife. 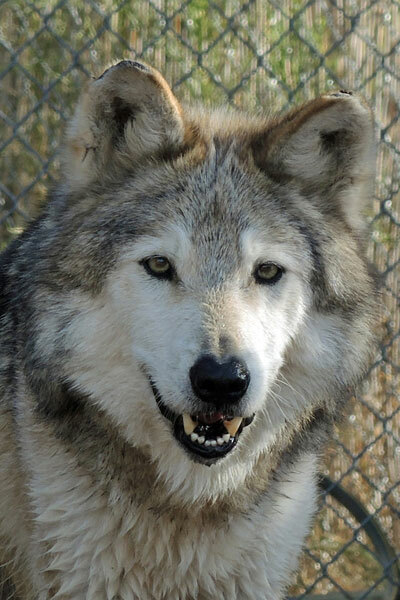 Retirement turned out to be a new chapter in M877's life when he was introduced to a female wolf as a companion for his old age. He fell for F891 Chooli (pronounced Hooly) within hours of introduction. She played hard-to-get for a whole day before she decided to flirt with him and they've been practically inseparable ever since. Among our Mexican wolf pairs, most are roommates. These two are true mates.